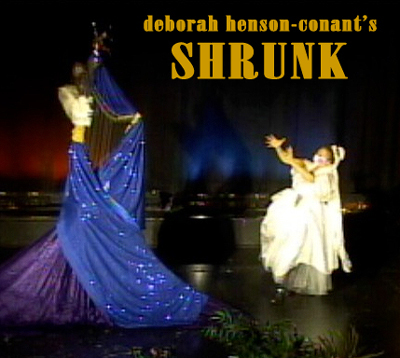 “Honey, I Shrunk the Harp”, is a graphic musical recount of DHC’s journey to reinvent the 6-foot-tall, 75-lb behemoth of a concert harp into a body-harp that could be worn with a harness. The 45-minute show spans 3 decades of exploration, and uses sculptural and costume elements to change the size of the instrument and give the audience the experience of the journey from discovery of the serenely Olympian – and immense – classical harp – through a therapeutic session where both the player and the instrument need a shrink. Throughout the course of the show – both instrument and player literally shrink in size, revealing more and more until the the play lifts the instrument from its pedestal and straps it on. “My goal was to create a piece that compresses this 30-year journey of artistic embodiment into 45 minutes of music and theater so the audience could experience everything from how impossible it seemed at first to even gets my hands around the huge instrument – to the elation of getting my hands on the first prototype of the body harp that now bears my name, the “DHC” electric harp. This is the journey of my own evolution with the harp, starting with my attempts to fit into the stereotype of a ‘real harpist’ and through the frustration to express my own creative voice that took me to physical coach, Tony Montanaro and eventually to a 30-year collaboration with CAMAC harps to create the instrument I dreamed of. This journey forced me to reveal my own artistic voice and desires at the same time as it was a technological journey to create a new instrument. In the end, the journey led me to a new instrument and a new relationship to my creative voice. DHC is the inventor of the “DHC” harp, in collaboration iwth the CAMAC Harp company, a harp which is now one of the most popular electric harps in the world, played by a growing number of harpists internationally. “Shrunk” is great to program as the first half of a 2-part show, with a second half that can include shorter musical works and a talk-back Q& A with the audience. This time-lapse video shows the building of the harp sculpture for “Shrunk”. NOTES: This show requires a few boxes to raise the instrument for the first part of the show and a small ladder or large step-stool. BOOKING INQUIRIES: Email info"at"hipharp.com and include the preferred date, location, length of run, how you heard about Deborah Henson-Conant and any other pertinent information about your theater, audience or festival.